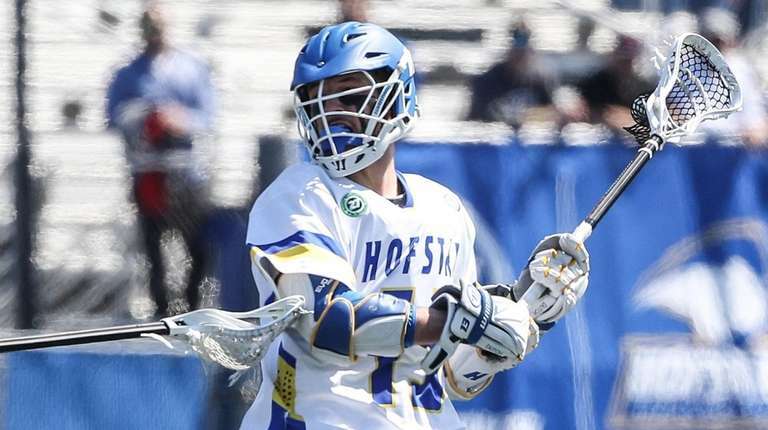 Hofstra (1-2, 4-8) dominated at the faceoff x as sophomore Brian Herber went 20-of-23, but the Pride struggled to turn those possessions into goals. Hofstra was held to three second-half goals Saturday afternoon, falling 13-7 to host Delaware in CAA play. Ryan Tierney, a Massapequa grad, led the way for the Pride scoring two goals, while Bryce Tolmie finished with one goal and one assist. Charlie Kitchen paced Delaware with four goals and five assists. Hofstra (1-2, 4-8) dominated at the faceoff x as sophomore Brian Herber went 20-of-23, but the Pride struggled to turn those possessions into goals. Delaware goalie Matt DeLuca, a Farmingdale grad, came up big between the pipes, racking up 18 saves and 14 of Hofstra’s 39 shots missed the net. The Pride trailed 6-4 at halftime, but Delaware (3-0, 10-2) broke the game open in the third quarter. Tye Kurtz scored less than two minutes into the quarter, while Kitchen and Dean DiSimone followed up quickly, giving the Blue Hens a 9-4 lead with 7:57 left in the third. Kitchen netted his second of the frame with 2:46 on the clock, making it a six-goal, Delaware lead, and the Blue Hens continued to bring pressure down the stretch. Tolmie’s unassisted goal with six seconds left in the third quarter gave Hofstra some much-needed, second-half offense, but Delaware responded with two goals to open the fourth. Kitchen and Kyle Kivinski both found the back of the net in the first four minutes of the quarter, giving Delaware a 12-5 lead, its biggest of the day. Hofstra answered with goals from Tierney and Dylan McIntosh, but it was too little, too late. Hofstra returns to the field Saturday at 2 p.m., hosting Drexel in the final CAA game at Shuart Stadium.